Interested in learning about the challenges and opportunities of growing poultry in the North? Join OMAFRA Specialists (including our Provincial Poultry Specialist, Al Dam), as we discuss the F.L.A.W.S. principles of poultry management. Other topics will include: poultry production and nutrition, husbandry, disease and biosecurity, rodent and predation control, barn structure and ventilation, loading and transport and more. These workshops are aimed at the small flock and Artisanal and Niche Market farmers. Come with your questions and be prepared to take home plenty of material. These are free workshops, so don’t miss out on this unique learning opportunity! Chisholm United Church Hall, 1469 Chiswick Line, Powassan, 10:00 AM- 1:00 PM, Saturday, June 11. I built a state-of-the art brooder inside a 40 ft. sea container that handles up to 600 day-old chicks for the first 3 weeks of their life. It works great. However, that sea container-brooder could now be the death of my farm, and my dream of supplying safe, nutritious, locally grown chicken for my small community. For the forth time, my municipality wants to pass a By-law to ban sea containers. After the first 3 attempts to pass a banning By-law were all failures, I thought the municipality had finally given up due to their repeated problems with the By-law's wording, and the public backlash. In baseball, three strikes you're out. Apparently, that doesn't count for municipalities. Attacking sea containers for the forth time, the Municipality certainly demonstrates their perseverance, bordering on Obsessive-Compulsive Disorder. Maybe I do too, as I continue to defend these de-commissioned steel boxes that are both affordable and useful on my farm (and elsewhere). So why is the Municipality so insistent to get rid of sea containers? We don't really know for sure, except for the cryptic statement in the draft By-law, claiming it’s “in the public’s best interest to control the placement and use of sea containers”. I don't believe that window dressing explanation of the municipality's motivations. Excellent municipalities deliver sustainable services at minimum cost. This challenging goal is aided by sea containers. If a sea container isn’t on concrete foundations, it’s neither a permanent structure, nor a building, nor MPAC assessed, nor property taxed. Mediocre municipalities think sea containers are a loophole in their quest for maximum tax revenue and maximum spending. The Roman orator and statesman Marcus Tullius Cicero frequently asked "Cui bono" [latin phrase meaning "Who benefits?"]. Special Interest Groups (ie. home & apartment builders, U-store developers, and others) sometime conspire with mediocre municipalities to ban sea containers. If banned, the next best alternative will likely benefit a Special Interest Group. So if sea containers are banned, mediocre municipalities and their Special Interest Groups both likely benefit. A devil's pact against the citizens. Fascism at its worst. It is unknown if these motivations are the root causes of the 4th attempt at a sea container banning By-law in my case, but it may be true in your case. Has your municipality banned sea containers? If so, let everybody know what happened & how you coped by posting a comment below. for storing the fresh and frozen meats produced by our farm. We customized a 40 ft. sea container to be a world-class brooder. Without that brooder, we can no longer raise pastured poultry. Without the income from our poultry operations, our farm cannot survive. 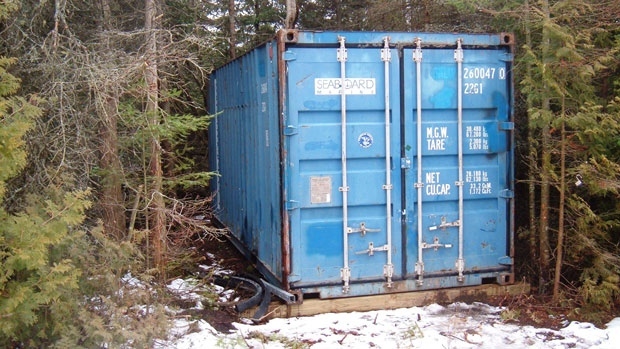 After a sea container has had 5 to 10 years of strenuous use on the high seas, it is forced to retire to its second career. The environmental 6R Rule (Refuse, Reduce, Re-use, Repair, Re-purpose, Recycle) tells us to re-purpose sea containers, rather than recycle them as scrap steel. By acting in a sustainable, environmentally sound manner, I have backed my farm into a dangerous corner with my municipality. The proposed By-law specifically prohibits using a sea container to house animals (or people, also eliminating sea containers as a source of affordable housing for all). Besides my farm, I am also concerned about current farms that have no sea container but could soon realize a need for one, or future farms that might need sea containers if they are to be a viable farm startup. What do they do after this By-law is passed? While I might get "grandfathered in" (ie. become legal non-conforming), others likely will not be entitled to grandfathering. c. 1, s. 6 (1). My brooder-sea container is quite innovative, so it likely meets the definition of innovative farm practices that are protected by the Act. The other sea containers have pretty standard farm uses, so I assume they would meet the definition of "normal farm practices". So why isn't my farm, and all other farms excempt from this encroaching By-law? "All farm lands, farms, farmers, farming operations, and farm processes are expressly exempted from this Bylaw, irregardless of what Zone they happen to be located in, and notwithstanding anything else in this By-law, and notwithstanding anything else in the latest amendment of By-law 2002-07 Zoning." So far, no comment from them on my "reasonable" suggestion.. I told the Municipality that if the municipality proceeds with this draft By-law as it is currently written, I plan to apply to the Normal Farm Practices Protection Board under this law to strike down the Bylaw as ultra vires the Municipality's authority under this Act so as to better protect my farm and all other farms in Central Manitoulin from this ill advised By-law. "biting the hand that feeds you"
My farm's LGD's (Livestock Guardian Dogs) know better, and have better manners than this.